The transformation instruction illustration on pack for the Rescue Bots Mini Sequoia is to poke the orange bear up the bum! Would people be interested in buying Hasbro licensed diorama to complement the toys? Or would it be a fruitless venture for Hasbro? Which diorama set(s) peek your interest most? Probably not. Lack of storage space and I would rarely use it. As a kid I had 2 S.T.A.R.S. bases which acted as my Autobot and Decepticon HQs, but they soon became too small as my collection grew. Honestly just using my imagination and available furniture and objects works fine. P.S. : another problem is scale, because that never quite works for Transformers. Even the old S.T.A.R.S. base's console and controls were out of scale for many G1 toys. 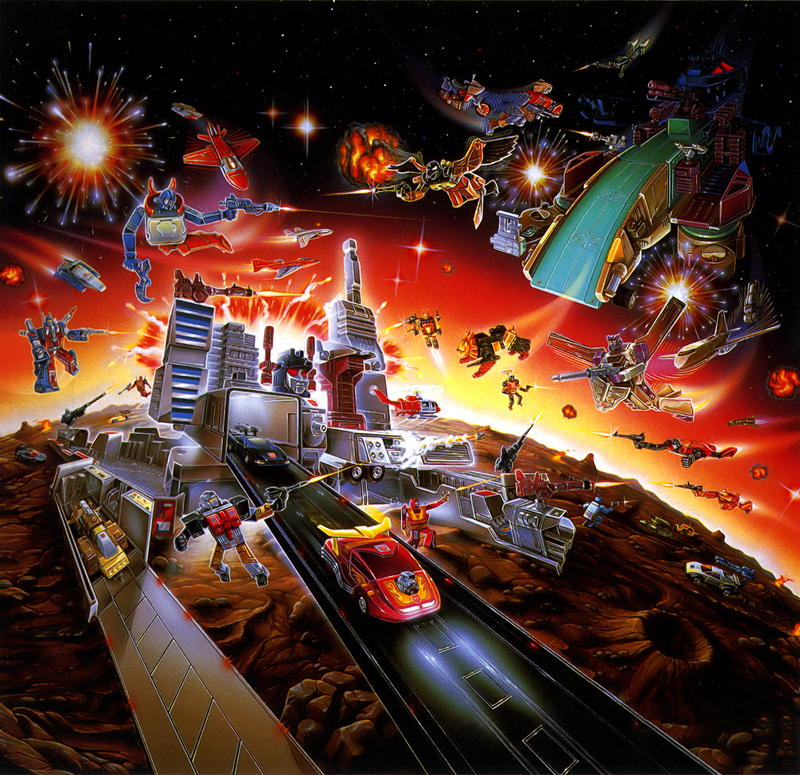 Yep, seems pretty hard to fit in enough characters into one diorama without it appearing like a huge hodge podge of a battle like the old (awesome) G1 box art. Newb question. Who are two characters in red below Octane (robot mode)? I think some sort of card based background would go well, manufactured in sizes to fit generic display cases, maybe have perforations to allow for customising to fit a certain shape as a background. I know there is something like this already manufactured by the ToyHax Indie group, they are very expensive though, and not cheap to get here either. I have a box filler from one of the movie leader boxes that has a view of earth from space in one of my displays. We got used to saying Prime for that cartoon show tie-in toy line didn’t we. I wonder how long it will take to saying “I’m looking for Bumblebee legion toys” will not sound like I mean the character. Although in his case I am looking for a legion class Bumblebee from the Bumblebee toyline. Does anyone else think the Punch/Counterpunch could make a decent Drift figure? The front of the car swept back on the shoulders could kinda look like the big shoulder pads he originally had. Maybe even try to make the second robot Deadlock.